"Got this recipe from the best Auntie in the world. Love them!" Mix zucchini, Cheddar cheese, and onion together in a bowl. 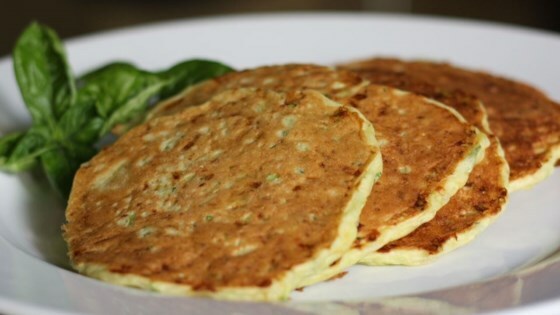 Stir eggs and biscuit mix into zucchini mixture until well combined. Heat vegetable oil on the griddle or large skillet over medium heat. Scoop about 1/4 cup batter onto heated griddle; cook until pancakes are browned, 3 to 4 minutes per side. Repeat with remaining batter. If Chef John's pancakes were any lighter, they would float off the plate. Before I make these, how do I eat them, with syrup or any other suggestions! I accidentally doubled the cheese and they were divine! My kids devoured them! I made a quadruple batch and froze some. We just reheat in the toaster and they taste great!